Winning the first one is tough, but repeating is even harder. Or so, the experts say. If that is the case, not sure there are words to describe the feat No. 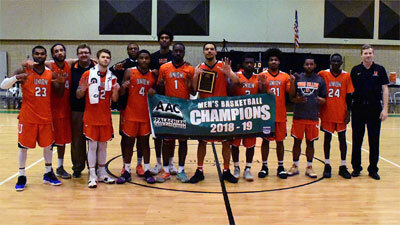 12 Union College accomplished on Saturday as it captured its sixth consecutive Appalachian Athletic Conference (AAC) Men's Basketball Tournament championship. The feat was not easy in the slightest, needing to overcome a four-point deficit in the final 15 seconds to force overtime en route to the 95-85 victory over No. 19 Montreat College (N.C.). Not only have the Bulldogs won the AAC Tournament in each of the last six seasons, but they have also won or shared the regular-season crown all six years. Union already locked up its berth to the NAIA Division II National Championship Tournament with the regular-season title. Since it won both titles, Montreat receives the conference's other automatic berth as the regular-season runner-up. The national tournament is set for March 6-12 in Sioux Falls, S.D., and the bracket will be announced on Wednesday, Feb. 27. It was a battle throughout with six ties and 12 lead changes through regulation. The largest either squad owned during the first 40 minutes was seven points. Montreat appeared to be in control as a Terrell Sheffey old-fashioned, three-point play made it 77-71 with 3:22 to play. K.J. Duronslet (6'3''-G) scored to pull Union within 77-73 with 1:04 left, and Austin Cummins (6'0''-PG) buried a 3-pointer with 11 seconds remaining to make it a one-point game. With six seconds on the clock, Austin Butler sank a pair of free throws to give Montreat a 79-76 lead. Then, Jakobe Wharton was fouled with 1.1 seconds to go attempting a 3-pointer. The junior guard calmly swished all three free throws, sending the game into overtime knotted at 79-all. Tied at 83-all in overtime, Duronslet hit a 3-pointer and added a layup as part of a 7-0 run as Union grabbed a 90-83 lead with 1:33 left. After Montreat responded with a quick bucket from Daniel Vitiello (6'2''-G), Jabari Antwine (6'1''-G) countered with a runner through the lane for a 92-85 lead with 51 seconds remaining. Union hit 3-of-4 free throws down the stretch to seal the 95-85 victory and the tournament championship. Antwine finished with a season-high 15 points to go with seven rebounds and six rebounds. During the tournament, he averaged 12.0 points per game and tallied 18 rebounds, 14 assists, and 12 steals in being named the Tournament MVP. Joining Antwine on the All-Tournament Team are teammates Demarkus Loman (6'5''-g) and Duronslet, Butler and Jeron Hemphill (6'4''-F) of Montreat, EJ Bush (6'4''-G/F) of Bryan, and Aaron Levarity (6'6''-F) of Milligan. Duronslet and Loman each posted a double-double for the Bulldogs in the title game. Duronslet posted 22 points and 10 rebounds, while Loman delivered 17 points and 13 rebounds. Wharton added 18 points, and Lance Blakley chipped in 14 points. For Montreat, Butler led the way with 22 points, while Alonzo Mobley (6'3''-G/F) and Nicodemus Payne (6'8''-F) each had 13 points. Hemphill posted 12 points and 12 rebounds, and Sheffey knocked in 10 ponts. G: Corey Benton (6'1''-G) of Columbia Internat. PG: Arthur Pearson (5'9''-PG) of Columbia Internat. G: Brandon Doss (6'5''-G) of Columbia Internat. G: Eric Graham (6'1''-G) of Columbia Internat. G: Tyrone Dantzler (6'1''-G) of Columbia Internat.